Real Name: Unknown. First Appearance: Spawn # 6. What's his Story? : Metal parameshed with flesh. Ice cold calculation wrapped with a passion for violence. All driven by the organic heart of a murderer. This is Overt-Kill. Literally a 'Mafia-made man'. Nicholas Rocca. Born and raised in Palermo, Sicily. At the age of thirteen, he was extorting protection money from village store owners and selling his already powerful talents as a leg breaker to other youths. At the age of fifteen, he caught the notice of Sicily's top boss of organized crime, Luciano Bartino, by killing two of Bartino's best thugs with his bare hands. Instead of having young Rocca killed for his crime, Bartino took Rocca under his wing and began training him to channel his strength and violence for his own use. Nicholas Rocca became known as The Palermo Pit Bull. His body continued to grow as large as his thirst to punish. Bartino took great pleasure in knowing that all of organized crime both envied and feared his hulking hit man. In one of his murderous rampages across the Strait of Messina into Calabria, Rocca killed the son of Vito Calogero. Calogero, a long time rival of Bartino, was enraged. He quickly made plans to kill Rocca. Calling in favors from the oil-rich Arabs that he had helped out on occasion, Calogero had the out-of-town Arabs ambush Rocca. Using over 50 gunmen, the Arabs nearly shred Rocca into hundreds of pieces. He was left for dead. Rocca was found by Bartino's men and brought home. Through a miracle or the fact that a heart so evil refused to die, Rocca still had a flicker of life left in him. While in Sicily on business with Bartino, Antonio Twistelli, the crime boss of New York, used this moment to seal himself to the debt of Bartino. Twistelli suggests that Bartino try once more to make a Mafia super hit man like they did once before with the failed Tremor attempt. This time they would have a willing patient in Rocca. They would also use more bionics. Rocca begged Bartino to do it. Revenge now fueled the flames to keep Nicholas Rocca alive. The experiment in the paramesh system went far beyond their expectations. Rocca's body and mind embraced the operation fully. That night Nicholas Rocca became the name whispered in fear by the Mafia's enemies - Overt-Kill! The first order on Overt-Kill's menu of manslaughter was the death of Vito Calogero and his crime family. It was done in a flashburn of mayhem. Overt-Kill's name became a legend in the circles of organized crime throughout the world. 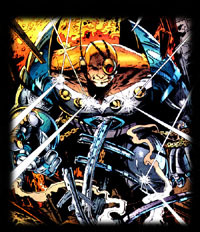 Bartino began using Overt-Kill as a way of having other members of the organization become indebted to him. He would loan Overt-Kill's services out for favors to be named later. One such loan was made to Antonio Twistelli. Twistelli brought Overt-Kill to New York to crush Spawn. It was by far the most physical battle that Spawn had ever dealt with in his short time back from the dead. If not for a mechanical oversight with Overt-Kill's circuits, he would have caused Al Simmons to be the only person to die twice.